Knights, Vikings, and Samurai, oh my! See what we thought of our historically inaccurate time with For Honor. For Honor isn't historically accurate, but that quality manifests in the best way possible. It's like someone took a kid's dream of the "coolest war ever" and made a multiplayer action game out of it. This concept could run the risk of seeming hokey or lame, but instead, Ubisoft Montreal somehow made a unique and stylish fighter that requires some of the most precision I've seen in an online title. The cornerstone of For Honor is the "Art of Battle" system which has players moving between three different positions for attack and defense. By toggling your hero's stance to the right, left, or top, you can change what direction you block attacks from and also pick from which direction you'll attack. What makes the Art of Battle system so enthralling though are the layers added on top of it that make For Honor's combat so complex. 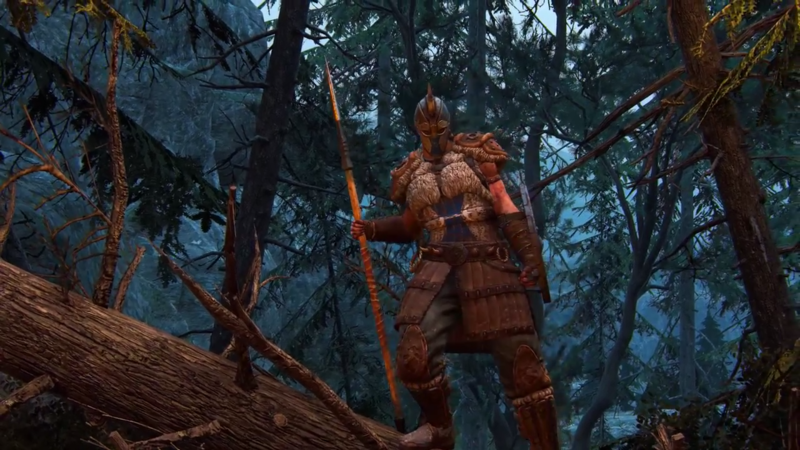 While each hero class in For Honor can guard and attack from the same three positions, they also have move-sets and feats that are unique to them. The Viking Warlord is slow and carries a shield and gladius and concentrates on defense and counterattack. The Warlord has the special ability to block attacks from any stance, and once the enemy's weapon has clanged off your shield, you can instantly turn your defensive into an offensive. 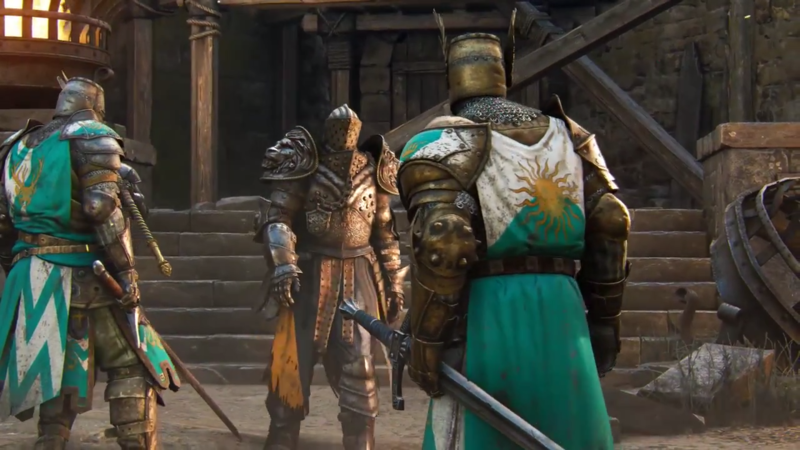 A counter-balance to the Warlord would be the Knight Peacekeeper. The Peacekeeper is nimble and doesn't have the shield and armor of heavier heroes, but they can dance around their foes and inflict bleeding attacks that slowly drain their health. Each hero class has strengths and weaknesses, but they're balanced to the point where no one class is greater than any other. They all have their uses, and in the right hands, any of them can sweep the battlefield. One of the best parts about For Honor is that the abilities and playstyles of the heroes are complex to the point where it would take a long time to become proficient at playing as all of them. That means there's a certain pride in being a great Warlord player or a stellar Peacekeeper. You can also customize your hero classes with cosmetics and new equipment. New colors, emblems, and outfits can be unlocked by leveling up, accomplishing tasks, or with in-game currency. Items that you win after matches can modify your equipment and add or subtract from your hero's stats. A suit of armor, for example, can add to your stamina regain, but it'll also take away from your revenge mode timer. To improve your equipment you have to break down items from your faction into steel and use as currency for upgrades. These various in-game currency systems are somewhat of an annoyance in the game. The coins you need to buy cosmetic items are also available for real cash in the in-game store, and it seems like their drop rates are a little low in the game. The hero customization process, in general, could have used a little streamlining, and I often found myself just worrying about equipment that raised stats rather than fooling with cosmetics because of how the interface was arranged. For Honor's campaign isn't a throwaway even though the meat of the title is focused on its multiplayer component. The single-player mode sets somewhat of a stage for For Honor. The world is at peace after a thousand years of war. However, a warlord, Apollyon wants to start the wars again. There's no real in-world explanation for why Vikings, Knights, and Samurai all live in areas directly next to each other, but there doesn't have to be. The campaign takes you through missions playing as a member of each of the three factions and is an excellent primer for multiplayer. The story isn't award-winning, but it's well thought out, especially for a mode that could have been left out without much notice. The draw of For Honor is multiplayer, and this is where you get your money's worth. There are multiple modes to play, all of which are very different in their execution. My current favorite mode is 1v1 Duel, where it's just you and another player facing off in a contest to see who can win the best out of five rounds. In 1v1 Duels any advantage your equipment might give you is turned off, both heroes are set to an equal level. If you want to include a friend, you can play 2v2 Duels, which play much the same way as 1v1 Duels but with a partner. There are 4v4 modes which consist of Elimination, a best of five rounds mode, and Dominion which will probably be the most popular game mode. Dominion has you fighting as two teams of four heroes each, and both sides also have AI soldiers that spawn on the battlefield. Each team seeks to capture three points on the map and hold them. The longer you keep these points, the more points you get. Once a team hits 1000 points, the other team is put into sudden death mode and can't respawn again until they capture a point from the opposing team to bring them back under 1000 points. It's this mode that you'll focus on making specific builds of heroes using equipment, and it's also the most competitive-gaming-friendly mode. For Honor is a great game, but unfortunately, it has a huge failing at launch that adds an unnecessary amount of frustration to playing. For Honor uses peer-to-peer multiplayer instead of dedicated servers, and at launch, their system is incredibly buggy. I found myself trying to enter Matchmaking and having it act as though no one else was online, even though I knew there was. Restarting the game fixed this issue, but it's happened multiple times and isn't something that should occur in a full release. Additionally, there have been a lot of problems with NAT type incompatibilities so that during matches, players will suddenly start losing connections one after the other. If there were dedicated servers, Ubisoft could have gotten around the NAT type issue with relays, but since you have to connect to peers directly, you're just out of luck sometimes if you have a moderate or strict NAT type. For Honor will inevitably be a favorite of mine. It combines easy to pick up, complicated to master fighting and action-style gameplay with compelling gameplay types and there's nothing quite like it. However, if you were looking for a single-player game, you might not want to purchase this title. The heart and soul of For Honor are its multiplayer modes, and unfortunately, at this time, there are enough issues with matchmaking and peer-to-peer connections that you may want to wait until Ubisoft has some time to fix those problems. However, once For Honor has a solid networking backbone I can say it'll be one of my go to multiplayer titles for the next few years to come. This review is based on a PC digital download code provided by the publisher. For Honor is available in retail and digital stores now. Complex and nuanced combat system is wonderful. Varied multiplayer modes keep things fresh. Lots of options for personalizing your heroes. Interesting and dynamic character classes. PC multiplayer infrastructure is atrocious. Menu interface can be awkward at times. I'd say only buy if you are interested in 1 on 1 duels. They are really intense and fun. Also a little stressful. 1 on 1 it's a 10. Everything else it's a 7. I've already fought the dedicated server fight and lost. It's above the average gamer's head why they should care and because they don't the developers will go with the cheaper and easier "more flexible" P2P system whenever they can get away with it. Love 1v1 duels, like the concept of Dominion, but everyone gets in the damn way when you're playing. Feels like a typical Ubisoft game. Good ideas, bad execution. And the UI is terrible.